Aren't these the words every mother longs to say? 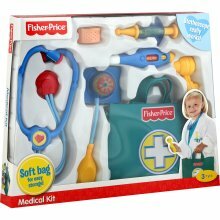 I expect nothing less from my kids, and as Big E's interest in his Fisher Price Medical Kit ramped up, so did my hopes. But as I was working on all the future braggity brag lines I'd throw out to my Mah Jongg group just like unwanted tiles, a few clues arose that led me to believe I do not have a budding physician. 1) For whatever reason, our doctor kit has two shots. Lucky me. As Big E assessed my ailments he decided I needed to have both shots administered, in unison, while singing the brilliantly written LMFAO song, "Shots." Haven't heard it? Look it up. It is about taking liquor shots, but Mr. Yoy thought it would be HI-LARIOUS to teach it to Big E.
2) My back is whack. Really it is. This is the second time this month I've become incapable of bending over and picking things up. I've resorted to dropping Little E into his crib like an A-bomb. He is not a fan. Anyway, I was complaining to Big E about my bag and he proudly exclaimed he would examine me. He took the toy thermometer and placed it up to my lower back. I took a second look. Yep, he was right, there was a big smiley face. I must be imagining my symptoms. 3) After a thorough exam, Big E finally got around to looking in my ears. EAR WAX! SO MUCH EAR WAX! I grabbed his little tool away from him and scowled at him. So much for his bedside manner. Tonight, I'm bathing in a little bit of disappointment. Mr. Yoy has already said there was no way he'd let his kids become attorneys, so what does the future hold for Big E? Maybe a fast paced life of tax returns? The Ten Hour Road Trip: Have I lost my mind?